(i) improve the capacity of 10 JGVK staff and 100 beneficiaries (poor local farmers) for optimizing the pond management of semi-intensive integrated carp-mola ponds in order to reach a production of 3-4 tons per hectare. (ii) establish a small local hatchery to secure local availability of quality carp fingerlings. (iii) secure supply of fingerlings to the local consumers through a number of local fish farmers. 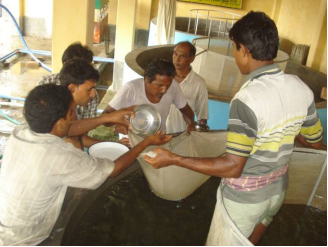 JGVK staff were trained on hatching fish Juvenile, nursing, brooder fish management and pond preparation. Based on this training, JGVK staff organized orientation and trainings of local farmers. A small hatchery was set up with the guidance and support from experts like Dr. Nandeesha and his team. Total renu spawn production from the hatchery was 303,396,418 batis (one bati contain 30,000 fish spawn) respectively during years 2008-2010. Accomplishments also include local availability of good quality fish Juveniles (spawn) from hatchery and growing fish production in the area. Poor farmers earn money by selling fingerlings, fries and fish. The cost benefit analysis of 11 nursery farmers shown that on average they are getting Rs. 3000- 4000 as net income within 25-30 days. Improved knowledge base of farmers: Series of orientation, exposure by international, national and local experts and practical application/demonstration were useful to local poor farmers. Thus increasing their cash income and nutritional content in their diet. Infrastructure has created a positive impact in the area: The infrastructural facilities like setting up small hatchery, demonstration nursery and brooder pond at the JGVK campus motivate poor farmers and pond owners from surrounding areas for better fish farming.